Sleek. The Zenbook is one of the few subnotebooks with a dedicated graphics card: powerful graphics performance in a compact form. In addition, the Zenbook has low noise and temperature emissions and good battery life. Slim, stylish and powerful - those three words capture the essence of the Asus Zenbook UX303LN. We previously tested the Haswell configuration of this model and now we have the Broadwell version of the successful subnotebook on our test bench. We use the Dell XPS 13, the Apple MacBook Pro Retina 13 and the Toshiba Portégé Z30-A-12U for comparison purposes in our in-depth review. As both Zenbook UX303LN configurations have the same build, we will skip some topics which we covered in the previous review. 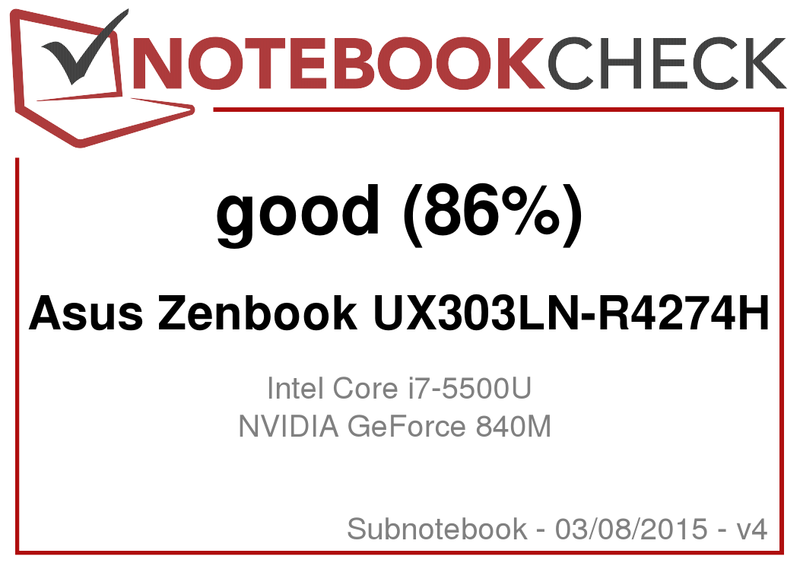 For more information about the case, the connectivity, the input devices, the display and the speakers, we refer you to the review of the Zenbook UX303LN-R4141H (Broadwell). The two Zenbook-UX303LN models we tested have the same panel. However, this does not mean that they offer identical values, which is normal. Two identical panels are never exactly the same. The Asus Zenbook UX303LN is a powerful 13.3-inch subnotebook with good battery life. Asus offers various configurations and our test model is available for 1,200 Euros (~$1265). If you give up on the dedicated graphics card, you can buy one of the cheaper, yet identical models from the Zenbook UX303LA series. The price range for this series starts at 700 Euros (~$738). The Zenbook runs on the Intel Core i7-5500U dual-core processor (Broadwell). The CPU runs at a base clock speed of 2.4 GHz. Turbo allows the processor to boost its speed up to 2.9 GHz (two cores) and 3 GHz (single core). Turbo is available while the laptop is plugged in or on battery: the processor completes the CPU tests of the Cinebench benchmark at max speed. In comparison to the Core i7-4510U in the Haswell model, the Core i7-5500U CPU offers 15% more performance. The system runs smoothly and we did not encounter any issues. The PCMark benchmark results are very good. The results of the Haswell configuration are a little lower, as that processor is weaker. Competitors, like the Apple MacBook Pro Retina 13, are far behind the Zenbook as they have weaker processors and GPUs. The Zenbook is equipped with a Solid State Drive from SanDisk. It is a 2.5-inch model with a capacity of 256 GB. The SSD has two partitions: the system partition (95.3 GB) and a data partition (130 GB). The device offers good transfer speeds. Like its Haswell predecessor, the Broadwell test model in front of us also has a free mSATA slot (half-size) for SSDs. The user can swap out the 2.5-inch SSD for an HDD with more capacity if they install an mSATA SSD. Sadly, it would have to be a half-size mSATA SSD and the pickings are meager. Furthermore, the price per GB is higher for half-size mSATA SSDs than for full-size mSATA SSDs or a normal 2.5-inch SSD. The Intel HD Graphics 5500 IGP and the Nvidia GeForce 840M GPU power the Zenbook. The switchable graphics (Optimus) allows the user to dynamically and automatically swap between the graphics processors depending on the scenario. The conservative Intel IGP is useful for everyday use or while running the laptop on battery. The GeForce GPU is useful for demanding programs, like games. The middle-class GeForce GPU supports DirectX 11 and operates at 1,029 MHz. Turbo can boost the speed up to 1,124 MHz. The 3DMark benchmark results are a bit better than those of the Haswell model. We believe this increase is due to the more powerful processor and updated drivers. The hardware allows the user to run most games in the HD resolution (1366x768 pixels) with medium or high quality settings. Full HD resolution is only possible for a few games: mostly older games or games with low requirements. Unlike the Haswell model, the fan of the Broadwell test model runs permanently while idle, but at low speeds. The fan is only audible in quiet surroundings. During the stress test, the fan speeds up and the emissions reach 39.6 dB - a moderate level. The fan does not need to turn up any further as the CPU is throttled during the stress test. The Haswell model emits a little less noise during the stress test. The stress test on the Zenbook. The stress test (Prime95 and Furmark run simultaneously for at least an hour) runs differently on the Zenbook when it is plugged in and when on battery. On battery, the laptop processor runs at 2.5 GHz. Every now and then, one of the cores drops down to 500 MHz. The graphics core runs at 281 MHz and abruptly speeds up to 1,124 MHz. 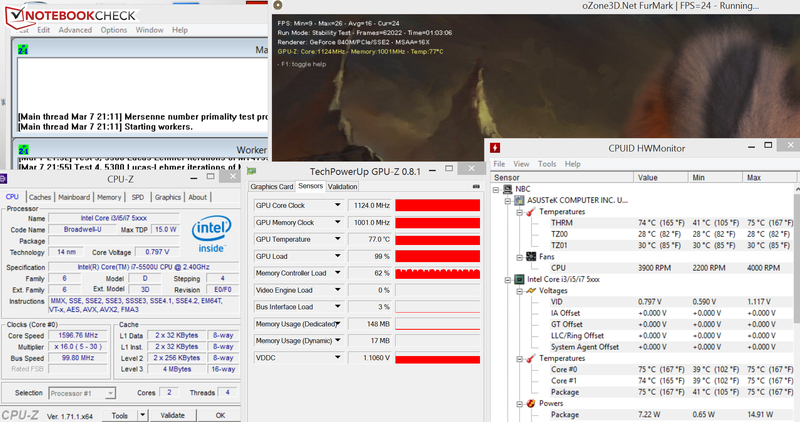 While plugged in, the GPU runs at full speed (1,124 MHz) and the CPU is throttled to 1.6 GHz. Fortunately, the case does not heat up too much during the stress test. The case only hits the 40 °C mark near the fan. Surprisingly, the Haswell model heats up much more. The reason: the CPU of the laptop is not throttled as much. While idle, the consumption of the Zenbook is below 10 W - a good result. We noted the same value in the Haswell model. During the stress test, the power consumption rises to 52.1 W, which is to be expected for such powerful hardware. At load, the power consumption of both models is the same. In the practical WLAN test, our script loads different websites every 40 seconds. The "Balanced" power profile is turned on and the brightness is set to around 150 cd/m². The Zenbook offers a runtime of 8:50 h. It does not run as long as the Haswell model (9:40 h), but the test model still offers good battery life. 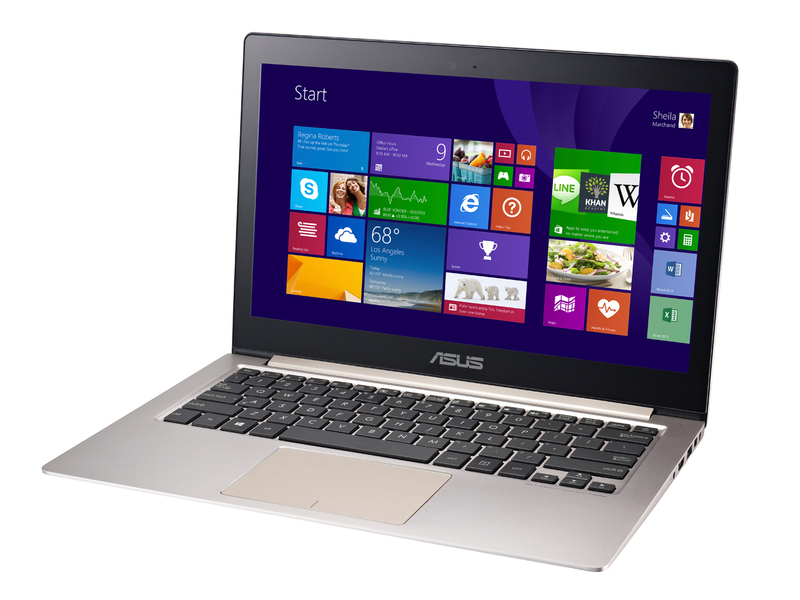 The Asus Zenbook UX303LN-R4274H is a compact, mobile 13.3-inch subnotebook. Despite the slim build, the laptop offers high performance and is capable of gaming. The laptop barely heats up and runs quietly. It offers good input devices and long battery life. A Solid State Drive ensures the system runs smoothly. Furthermore, the matte IPS panel is a great feature, which produces a good picture (subjective). The only flaw is the poor contrast. A maintenance flap is not to be found on the laptop, but the device can be maintained: the bottom is removable. Furthermore, the free mSATA slot (half-size) provides upgrade options. The entire package is attractive: a sleek subnotebook with great performance. The panel should have stronger contrast. Dell XPS 13, Apple MacBook Pro Retina 13, Acer Aspire R13 R7-371T, Asus Zenbook UX305, Toshiba Portégé Z30-A-12U, Samsung ATIV Book 9 Style.